Last Sunday, three of us in my group woke up shortly before 4 am to meet our guide and walk in the darkness towards a ritual hundreds of years old. 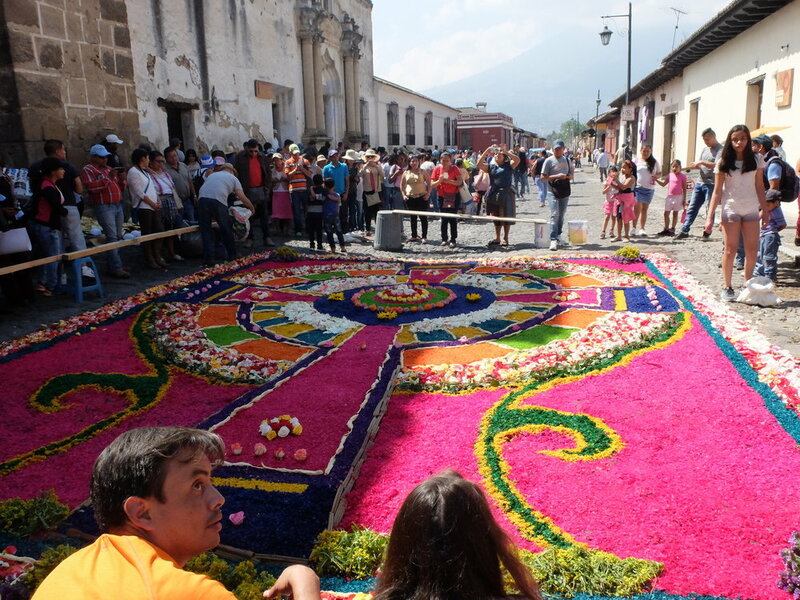 Along the way we stopped to watch huge carpets being created on the cobblestone streets out of brightly-colored sawdust, patterned in traditional Guatemalan designs, at times adorned with long green pine needles, flowers, and vegetables. The community artists creating these carpets sometimes used flour sieves to shake new colors of sawdust onto mosaic cardboard templates laid carefully on top of the existing colors. To put details in the middle of the carpets, long wooden boards were suspended over the carpets, the artists laying on top of them to complete their work. Floodlit in the dark, they were breathtaking. We joined other pilgrims walking along the way, as the streets were for the most part closed to cars. After more than a mile hike in the pre-dawn, we arrived at the Catholic church in the village of San Bartolome, on the outskirts of Antigua. A Mass was already being performed on a raised platform in the courtyard, and close to a thousand people were already gathered when we arrived. Standing at the back edge of the crowd, we waited more than an hour before the Fifth Sunday of Lent procession slowly made its way out of the church just as the sun began to light the sky. The 40-foot wooden platform inched its way out the door, as if the church itself were giving birth. Carried by 90 men dressed in purple robes with hoods that covered them from head to foot, the statues on the platform depicted Christ’s suffering as he carried his cross toward his crucifixion. I was told that the platform weighed 7000 pounds, and over the course of the procession that wound its way through the streets of Antigua over the course of 19 hours, over 10,000 men would take their turn at shouldering that load. Followed by a band whose musicians would accompany the platform the entire day with no replacements, the somber music perfectly reflected the events being depicted. After a while, another smaller platform emerged, this time the Virgin Mary being carried by women dressed in black and white. The procession made its way along the streets packed with the faithful – and the onlookers. The beautiful carpets that had just been created and laid out the path of the procession were walked on and destroyed – symbolizing the impermanence of life. Trying to stay ahead of the procession so we could see the beautiful carpets before they were trampled was one of our goals, once we had stopped back at the hotel and picked up the rest of the group that had chosen a good night’s sleep. When the procession finally passed by the spot I had staked out to watch them go by, I was struck by the faces of those carrying the heavy load – a mirror of the determination and suffering that was depicted on the face of the statue they were carrying. It was an experience I won’t easily forget, a tangible symbol of a community working together to create an all-encompassing, shared ritual that illustrates the deep devotion they have to Catholicism as well as their culture.